School Boardmember Alan Shulgon (left) waits for Tuesday’s election results with his wife and fellow School Boardmember, Hedy (center), and City Councilmember Robert Zwolak. Shulgon lost his bid to remain on the board. Hamtramck voters remained true to their Democratic roots and overwhelmingly supported Democratic candidates. Unfortunately for Democrats in the state and nationwide, it wasn’t a good election day for them. Many Democratic candidates were knocked out of office or failed to topple incumbent Republicans. In Michigan, Republicans gained seats in both the Senate and House of Representatives. Hamtramck voters also came out in droves. Some 3,702 voters participated, more than in any other mid-term election held in Hamtramck in recent memory. Both parties pushed voters to vote early by absentee ballot. There were 100,000 more voters who used this method in the state than in previous elections. Hamtramck was no exception. About 1,200 absentee ballots were cast in Hamtramck. Only recently has the city seen a steep increase in this method. “This is the new normal,” said City Clerk August Gitschlag. While the number of voters this past Tuesday was impressive, it still represented less than 40 percent of the total number of registered voters. 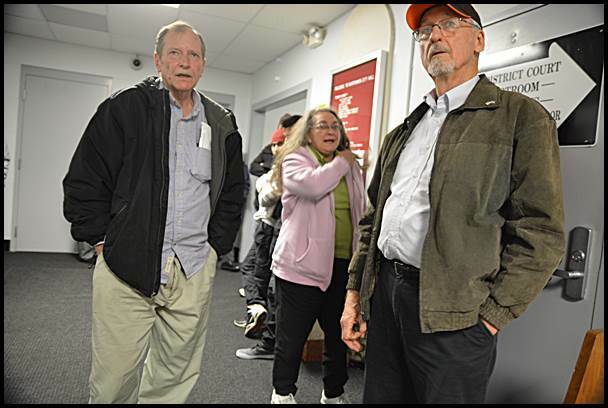 The increase in voters led to some longer than usual waits to receive and process ballots. However, the longer lines were generally welcomed as a sign of increased interest in participating in the democratic process. “That’s the way it should be,” said one poll worker. One reason why there might have been an uptick in voters here in Hamtramck is that 15 candidates were running for five seats on Hamtramck’s School Board. After the polls closed, Hamtramck City Hall was packed with supporters of school candidates, eagerly awaiting election results. There was some disappointment among some, of course, but School Board candidate Saad Almasmari alluded to dark money at work, saying some candidates spent upwards of $10,000 to win a seat on the board. Final campaign reports are not due for another month or so. In some of the more notable statewide races, Hamtramck voters supported David Viviano, Richard Bernstein and Brian Zahra for Supreme Court justices. Voters statewide also chose those three candidates. Locally, Hamtramck 31st District Court Judge Paul Paruk easily won re-election to another six-year term. He ran unopposed. In the two proposals to ban wolf hunting, Hamtramck voters followed suit with state voters supporting the ban. Some of the highlights and observations of the day included three voters who requested provisional ballots. Two of the voters were actually registered in other communities, and although it was explained that they needed to go to their respective cities or risk having their Hamtramck ballots invalidated, they insisted on voting here. The third voter insisted there was a mix up and that she actually lived in Hamtramck. That ballot was reviewed by the Hamtramck Board of Canvassers, which happened after The Review went to press. Federal monitors were here, once again, checking on voter fraud and voter suppression. Apparently there were no instances of either found, but it was not known what spurred the oversight. There was one thing noticeably missing this election season: campaign signs. In the past Hamtramck streets were littered with signs, but this year, hardly anything. While there were hardly any campaign signs, there were candidate alliances. Two slates promoted all Bengali candidates and another promoted all Yemeni candidates. But one of the slates promoting the Bengali candidates came from Detroit pastor Horace Sheffield, who as far as we know never before got involved in Hamtramck elections. The postcard he produced was sent to local African-American churches. Sheffield in recent years has became more politically active. He recently ran for Congress, but his campaign sort of derailed after he was accused by his estranged wife of domestic abuse. Sheffield lost his bid to unseat Congressman John Conyers. Despite the larger than usual number of voters, City Clerk Gitschlag said the day went off “without a hitch.” After the polls closed at 8 p.m., it took about an hour-and-a-half to tally the final count. It took about 15 minutes for those waiting for the results to wade through the various races and then figure out who were the winners in the school board election. Usually one hears whoops and hurrahs for this or that candidate, but Tuesday was an exception. It was weirdly quiet, and the crowd slowly left without displaying a sign of a victory.